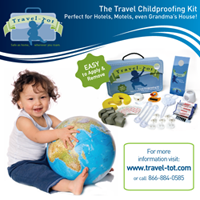 Travel-Tot: Sanity and the Single Parent! We are thrilled this week to be cross-blogging with Single Parent Travel - a terrific resource for single parents featuring everything from amazing tours to terrific destination ideas and travel tips for the single parent! The sight also offers insight and information on a broad variety of parenting issues (from bullying to piercings)! Single Parent Travel's trips and tours are unique and specially suited to the needs of single parents travelling with their children; with trips ranging from the Berkshires of New York to the Galapagos Islands - there is truly something for everyone! ﻿﻿﻿﻿﻿﻿Single Parent Travel was founded in 1983 by Brenda Elwell, a single mom of two and a world traveler whose dream was to make the travel industry aware of the unique needs of single parents travelling with children and to create trips and tours that would best accommodate those needs. In 1999, it grew to include the blogging masterwork of John Frenaye (a.k.a. Chief Single Dad). A recognized expert on family and single parent travel, John has been a travel columnist for 15 years with MSNBC.com and has been published in many major newspapers across the country. John also worked with Brenda to make her "dream itineraries" a reality by handling all of the trip fulfillment for Single Parent Travel! They officially partnered in 2006, when Brenda made the decision to gradually retire, and Single Parent Travel has been growing and expanding ever since! With more single parents than ever sharing the joys of travel with their children; it is critical for the travel and tourism industry to recognize the unique challenges facing these travelling families. It can be exhausting to make one set of eyes, ears, and hands available to share the adventure with your little explorers while managing to enjoy the trip yourself. Equally challenging, however, is keeping your attention constantly trained on your rapidly moving little travelers as they flit from place to place unearthing new and exciting things. And the adventures aren’t limited to whatever amazing attractions you might be visiting together; to a young child any new space constitutes an opportunity to explore! For some sanity-saving tips on childproofing hotel or other guest rooms, check out the blog entry below! With a shared focus of creating amazing family travel memories and keeping young travellers out of danger's way, Single Parent Travel and Travel-Tot wish you safe and happy travels!